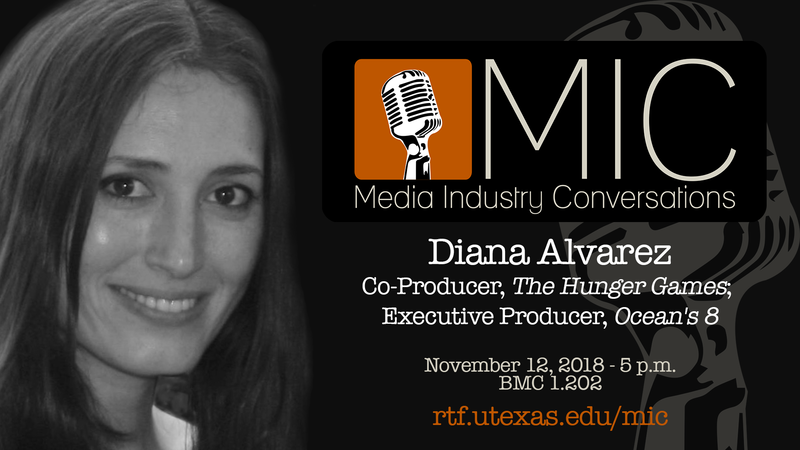 When: Monday, November 12, 2018 - 5-6:15 p.m.
Diana Alvarez (RTF BS ‘04) discussed her career trajectory, her roles and responsibilities as a Co-Producer for the Hunger Games and as an Executive Producer for Ocean’s 8, and her views on the current state of the film industry. Diana Alvarez began her career in entertainment at Larger Than Life Productions, working with Director Gary Ross on the Best Picture Oscar nominee Seabiscuit and the animated adventure The Tale of Despereaux. In 2012, Diana served as Co-Producer on the record-setting box office hit The Hunger Games, which grossed over $690 million worldwide and launched the 10th highest grossing film franchise of all time. She also co-produced the American Civil War drama The Free State of Jones starring Matthew McConaughey, Mahershala Ali and Gugu Mbatha-Raw. Most recently, Diana served as an Executive Producer on the box-office hit Ocean’s 8 which gathered an all-female cast including Academy Award winners Sandra Bullock and Cate Blanchett and grossed $295 million worldwide. Diana also serves as a mentor to Creative Activists at Creative Visions Foundation.